You can’t miss these glittery, shiny coins during the Chinese New Year season! These coins (placed into red envelopes) are supposed to signify prosperity and good luck. Your little ones were drawn to these coins straightaway! Besides being a great chocolate treat, these coins can be used for learning in great ways! 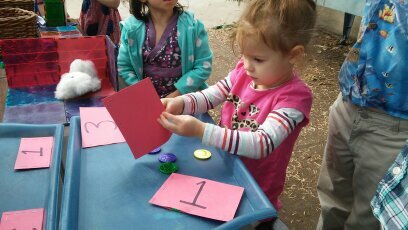 For this activity, your little ones Teach were taught how to count by using one to one correspondence according to the numbered envelopes shown! 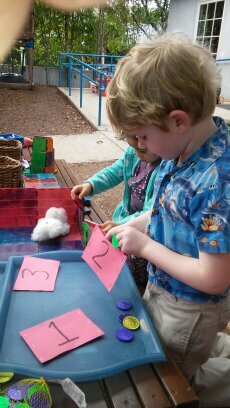 Students identified the numeral and counted the matching amount of coins that they slipped into the envelope. 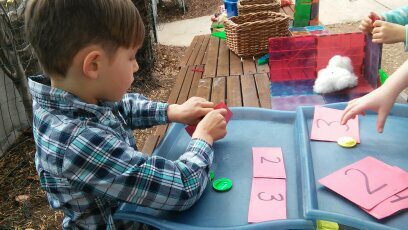 Young children’s development of mathematics knowledge and skills is receiving increasing attention in research and practice. The mathematics foundations (or developmental domains) cover the following five strands: number sense, classification and patterning, measurement, geometry, and mathematical reasoning. We are constantly exercising these skills in the many activities we do throughout the week!